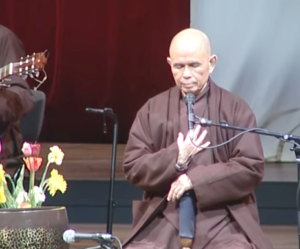 The 53-minute dharma talk offered by Thich Nhat Hanh took place at the Lower Hamlet of Plum Village on November 3, 2005. The audio is linked below and video will be available for our donors on Patreon. What does it mean, “I take refuge in the Buddha.” Buddha is the one who is mindful, awake, enlightened. Taking refuge is not believing in a God or deity. We all have a seed of mindfulness, understanding, and love. We can become a person who is fully awake, enlightened, just like the Buddha. Taking refuge is confirming the fact that you can be enlightened. You are a Buddha. This is not a declaration of faith, but a commitment to practice. In every breath we are taking refuge. In every mindful step we are taking refuge. The way in is also the way out. Our spiritual life should be established in that vision – being truly ourselves. Practicing to bring a spiritual dimension into your life. Through drinking our tea, preparing our breakfast, or brushing our teeth. These are spiritual acts. Not being caught by the future or the past. This is being a Buddha. Going home to ourselves. How is this act accomplished? Practicing in a community like Plum Village, everyone is supported by the sangha. This is taking refuge in the sangha. We have faith in the community. Helping to build this refuge for others. Story of when the Buddha was about 80-years old and how he offered the teaching on taking refuge in the island of yourself. Here we can encounter the foundation of ourselves – the island includes the Buddha, dharma, and sangha. This is the practice of Plum Village also. How do we respond when we are lonely, not feeling like ourselves? Our feelings of fear? Do we know how to practice going home to ourselves? Walking meditation is a method. Can we walk like a Buddha? Enjoying every step. This is a miracle. The Buddha-nature is within you and through mindfulness, concentration, and insight it is you that is performing a miracle. It is a practice of enjoyment. Editor’s Note: If the play button or download link doesn’t work, please try again shortly. We are testing out a new service and there may be caps on the downloads. Thank you for the patience. From the Assembly of Stars Meditation Hall at Lower Hamlet, Plum Village. This is the fourth week of the annual Summer Opening retreat at Plum Village. This short 45-minute talk on July 27, 2014 is in English with a focus on using the practice of walking meditation in order to be free. Both the audio and the video are available below. There is the habit energy of running in all of us. We’re not comfortable in the here and now. Many are caught in regret and sorrow concerning the past. The mark of suffering is very deep. How can we get out of that prison of the last? The same can be said about the future. Life is only available in the here and now. In the present moment. The practice of mindfulness can help us live in freedom. The practice of mindful walking can be very helpful. We can learn how to combine the breathing and walking together. We learn the practice. I have arrived. I am home. Teaching on the Kingdom of God as it relates to walking. Are you able to experience the wonder of life? In the here. In the now. If you know how to stop running, then you can heal yourself. I am solid. I am free. Each step made like this will cultivate more solidity and stability. These words of the mantra are not just wishful thinking. To be a Buddha is possible and to enjoy every step. In the ultimate, I dwell. What is the ultimate? Teaching of the wave. Learn the art of walking. Walk like a Buddha. Don’t walk like a sleepwalker.